Val Claret. Chalet Dominique offers an unbeatable location next door to the Tufs lift, the ski school meeting point and just across the piste from the lively centre of Val Claret. Chalet Dominique offers the luxury of fully en suite rooms and a shared Jacuzzi, sauna and steam room on the lower level of the building (for the use of chalets Valerie and Francois as well). It is modern throughout with a comfortable living area and spectacular views over the Bollin piste and Grand Motte Glacier. Chalet Dominique is housed within the same building as sister chalets Valerie and Francois and is accessed via an internal lift and central staircase. NB Images may be of a property similar in style to Chalet Dominique. We update Chalet Dominique's details often, but facilities do change. e.g. some extras listed by the supplier as "free" or included might only be for the first time you use them, or for one time per party, then charged for further use. If any specific feature is essential to your holiday, make sure you ask us to confirm the details of it before you book your holiday. This all inclusive holiday to Chalet Dominique in Tignes, France departs Saturday 18th April 2020, for a 7 night stay on a "catered chalet" board basis. A local tourist tax (Taxe de Sejour or Kurtaxe) is levied by many councils in European ski resorts. It varies by standard and type of accommodation and is age dependent, so not everyone is charged. It's not included in the basic price of your holiday and is usually paid locally. For reference, the average charged in winter 15/16 was between 50p and £2 per person, per night. Tignes lift pass price last reported as €294 (adult 6 day). Ask for a quote when booking Chalet Dominique. Chalet Francois Tignes France, Gatwick to Grenoble 18th April. "Easter 2014 in Val Claret"
A family group plus a few friends had a marvelous week at Chalet Dominique. We had a few non skiers with us and so the proximity to the shops and bars as well as the full length balcony went down really well, as did the steam, sauna and Jacuzzi room. The food was excellent as were the hosts Emma & Neil and nothing was too much trouble. Will we go again? Absolutely, one of the best chalets in the Alps and I've stayed in quite a few over the last forty odd years. "Chalet Dominique - Ideal Location"
Chalet Dominique is situated in an ideal location, ski in/ski out and ski school only yards away for anyone wanting to progress. Also fantastic for all lift aspects too, without having any unnecessary walking in ski boots. The chalet offers great views with comfortable surroundings, and all staff have always been great company, along with the food and advise given, you could not ask for more. We have stayed approx. four times in the chalet and had the fortune of friends and family we filled the whole chalet too. "Great week in Chalet Dominique"
We had a great week at Chalet Dominique - Emma and Neil were great hosts providing delicious meals and a friendly atmosphere in the chalet. The location was perfect for getting out on the slopes first thing and also for exploring Val Claret. The hot tub, sauna and steam room were the perfect treat at the end of a long day on the slopes - thoroughly recommend it! 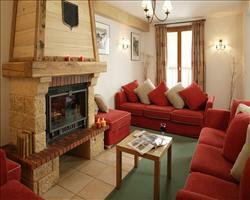 "In a cluster of chalets with great location"
You will be hard pressed to find a problem with this chalet. Sharing luxury spa facilities (double check this) along with chalets Valerie and Francois, it's great for meeting like-minded skiers if sharing, or booking some private space for your party if taking it for sole-use. Each bedroom is en suit and the chalet block is centrally located and basically ski-in ski-out, with the village just one hundred yards away. So whether you’re a group or a couple, you’ll be near the fun both on and off the piste, and with friends to enjoy it with.